Not even Black’s great performance can save this unfunny, stereotypical comedy that’s low on laughs and nuance. 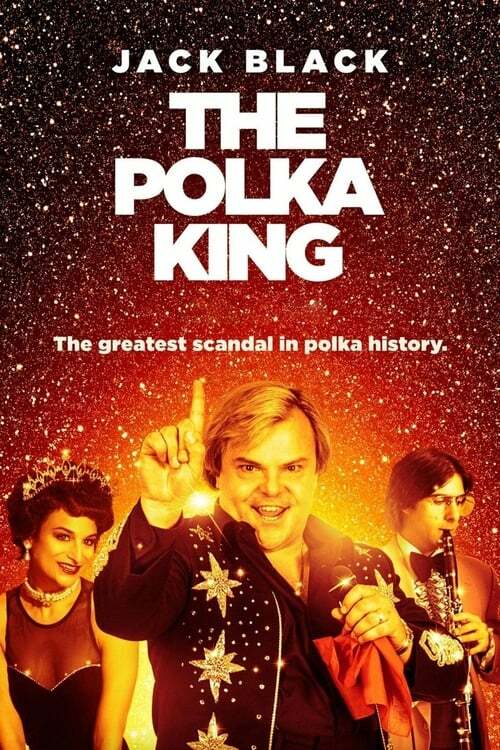 The Polka King is based on the true story about local Pennsylvania polka legend, Jan Lewan, who develops get-rich quick schemes in order to enjoy the finer things in life. Starring Jack Black as Jan Lewan and Jenny Slate as his wife, Maria, the film depicts a time in Lewan’s life when his gift shop business is failing. Lewan takes it upon himself to start building investors, with himself as the brand. Using the money from unsuspecting victims, he creates, among other things, a recording label and a travel agency. Even when the government comes knocking on his door, warning him to “close up shop” on his illegal dealings, Lewan is determined to keep the money flowing. Fans of polka music might enjoy the songs, and some of the acting, particularly that of Jack Black as an immigrant looking to make his fame and fortune in America. Black gets it down, right to the accent, the larger-than-life dreams, the big personality, and even the extensive hand gestures when he talked. Jenny Slate gave a passable performance as his wife. However, whether due to the writing or just her interpretation of her character, there seemed to be a lack of connection with her husband, both in on-screen chemistry as well as in the relationship itself. The actress that could’ve been the most interesting with a memorable character had she been given the proper screen time and lines was Jacki Weaver. Meant to be both the voice of reason and the comedic relief, the weakness of the storyline dooms her to be little more than just someone who appears on screen to rant about something and then disappear until it was time for her next rant. The character that made the least impact was Jan Lewan’s son, David Lewan (Robert Capron). Whether Capron was trying to portray a disinterested teenager or merely lacked the acting chops to offer anything new to the already mundane story, the actor failed to do much of anything except be used as a pawn to drive the story to its inevitable conclusion. Of all the shortcomings, The Polka King’s greatest failure was lack of a relatable main character. It’s hard to root for someone like Jan Lewan as he uses people’s money to get ahead with little regard for their welfare or well-being. While his character could be loosely compared to Breaking Bad’s Walter White, this film is inundated with a complete lack of character growth and most noticeably lacked a compelling conflict. Lewan was getting away with anything and everything he wanted…until he wasn’t. Even the most perfect schemes must have an equally perfect opposing character or conflict, otherwise the story feels too easy and monotonous. And this film was very monotonous. Throughout the film Lewan keeps exclaiming how much he loved his friends and investors, and more importantly, how much he loved America. However, by taking illegal investments and not registering his business dealings, he was effectively skimping on paying his taxes to the very country he supposedly loved. It’s movies like this that create the stereotypes about immigrants that people like President Trump can then exploit to their advantage. While Jack Black’s acting is never in question, I’ll admit to questioning his reasoning in taking on this particular role. While the laughs were far and few between, there were plenty of digs made toward immigrants, which as a child of an immigrant, I saw from a million miles away and didn’t appreciate. It seems to be a trend lately that many older comedians like Jack Black and Adam Sandler are getting multi-picture deals on streaming media networks like Netflix. However, while these actors may garner a small audience that’s nostalgic to see them on-screen again, I have to question why they’d be so desperate to take on roles and projects that are neither funny, nor entertaining.